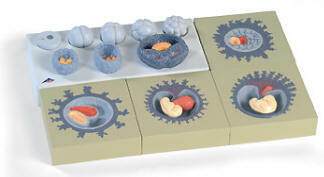 A remarkable series of 8 models that show the complete stages of development. Each is separately mounted on its own stand. Each model is also available separately. A set of five models. 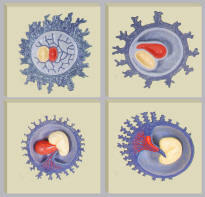 1st, 2nd and 3rd Month Embryos and 5th and 7th Month Fetuses. They are the same models listed separately above, but all are mounted together on one base. 13 x 41 x 31 cm. 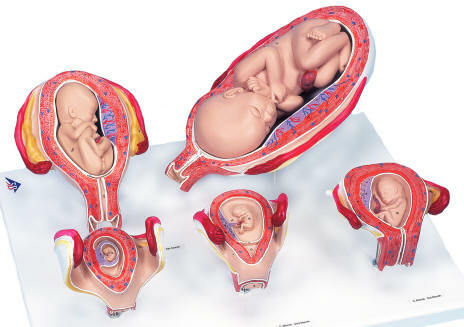 This human embryo replica shows the anatomy of an embryo at approximately 4 weeks old. 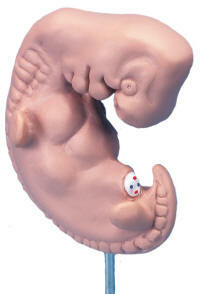 At 25 times life size this human embryo is great for studying human development. The high quality model is affordable without sacrificing any anatomical detail. 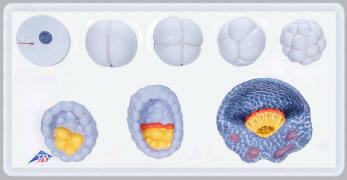 This enlarged model represents shows 12 stages of embryo development. The other 4 models are enlarged approx. 4-5 times. They show an embryo on 12th day, 20th, day, 28th day and second month. All next together to provide an effective and comprehensive presentation of the subject.